Nuisance dog barking can negatively effect your health and well being. It can also disrupt the peaceful enjoyment of your home and yard. Nuisance dog barking is against the law in most areas. It is the dog owners responsibility to control their dog’s barking. If you have a nuisance barking dog problem there are several steps that you can take to remedy the situation. Many dog owners are unaware that they have a barking issue. So the first step in solving your nuisance barking problem is to contact the dog owner. The best chance you have of solving this problem is if your neighbor takes responsibility and controls their dog’s barking. This is never an easy situation to handle. By the time most victims of nuisance dog barking decide to contact the dog owner, they are often too angry, frustrated or uncomfortable. If you have a good relationship with the dog owner, it may be easier to approach them. However, if you don’t have a good relationship, don’t want to ruin a good relationship, don’t know the dog owner, or don’t want to contact them personally, this leaves you with few options. 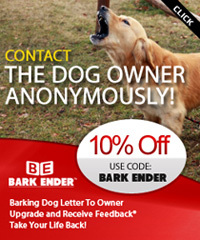 You can contact the dog owner anonymously (ex: Bark Ender™), purchase one of the many barking dog products on the market, Contact Animal Control, or do nothing and live with the disruption in your quality of life. Before contacting Animal Control, it is recommended that you contact the dog owner first. In some areas Animal Control will not address your barking problem unless you contact the dog owner first. If you decide to contact Animal Control, there are some things that you should be aware of. The first thing is to find out if there is a barking dog law or ordinance in your area. In most areas you must give your name, phone number and address, usually you cannot file an anonymous complaint. Whether there is a barking dog law in your area or not, you should keep a Barking Log to document when the dog(s) barks. You should also video or audio record the dog(s) barking as much as possible. By keeping a Barking Log and recording the barking dog, you strengthen your case when you do contact Animal Control. This will also help if you decide to proceed with a civil case. Click Here To Download A Barking Dog Log. Click Here to contact your local Animal Control. If there is no barking dog law or ordinance in your area, you have an uphill battle. Your best chance of solving this problem is if the dog owner decides to be a responsible pet owner and good neighbor. One of the many bark control products on the market may be your only solution. We still recommend using a Barking Log and video/audio recording the excessive barking, this may help if you decide to proceed with a civil case (lawsuit).